4 June 2010 was a beautiful warm summer day topped off with a brilliant blue sky. 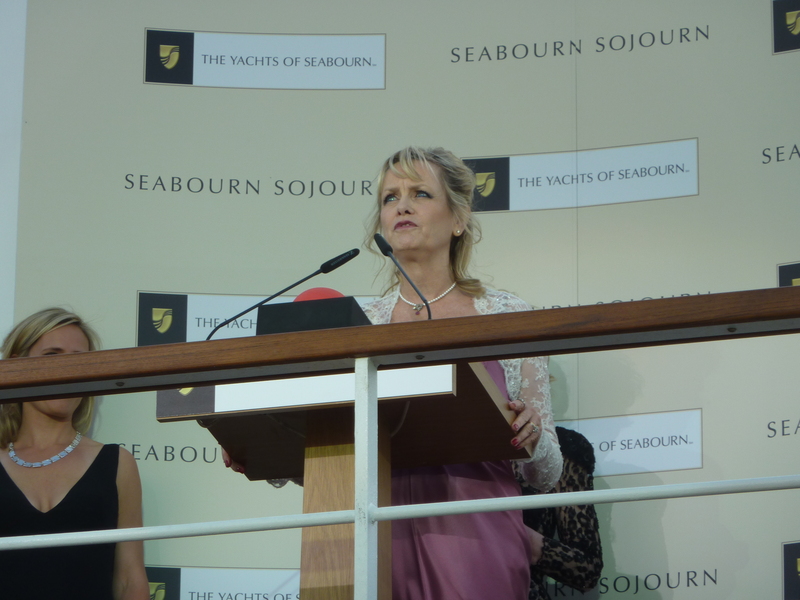 It was a perfect day for the elegant, black-tie naming ceremony of Seabourn Sojourn by 60’s icon Twiggy, who is godmother to the new ship. 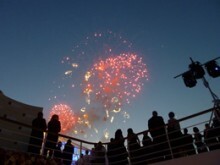 Anchored on the Thames at historic Greenwich, Champagne corks popped around Sojourn’s pool and elegantly attired waiters circulated with caviar and other Seabourn canapes. Ice sculptors engraved the Seabourn logo on the poolside ice bar, and many guests took the opportunity of a memorable photo behind/beside it. Extravagant flower arrangements were seen around the deck and floating in the pool, and dry ice tipped in the Jacuzzis gave the whole setting a mystical look as the resulting cloud enveloped the nearby cruise industry guests. The ceremony itself was actually quite short. 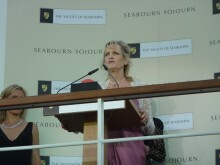 CEO and President of The Yachts of Seabourn, Pam Conover duly introduced Twiggy, comparing her to the new ship, both possessing elegance, style and timeless beauty. Twiggy, still very much the supermodel wore a sublime cerise dress designed by Catherine Walker, a British designer. She greeted the crowd with the words: “Welcome to my yacht!” With no further ado, she pressed a button, and the bottle of Champagne whizzed down a zip line, across the pool, and smashed against the ship’s superstructure. A wonderful day which we will treasure for many years to come. Hopefully we will sail on this exquisite new ship before too long. 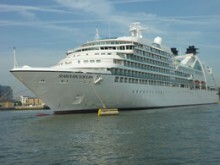 A full album of our photos can be found on the Deluxe Cruises Facebook page.